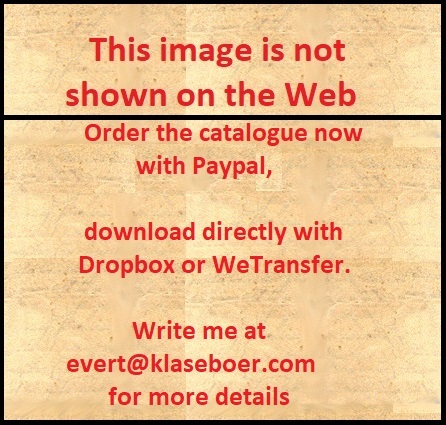 For stamps issued previous to 1896 click here. 1896 Jubilee issue, inscription '1845', two different designs 3 persons (1 c, 5 c, and 1 S) and 1 person (2 c, 10 c and 50 c). Similar forgeries of the values 5 c, 10 c and 50 c can be found on Bill Claghorn's forgery site: http://members.tripod.com/claghorn1p/Ecuador/Ecu65.htm. These forgeries are all printed very badly (compared to the genuine stamps). 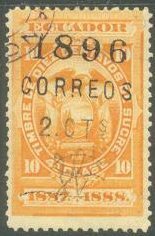 Other stamps of 1892 with overpritn 'TELEGRAFOS' were actually used as telegraph stamps, the values 1 c, 2 c, 5 c, 10 c, 20 c, 50 c, 1 S and 5 S exist with this overprint. 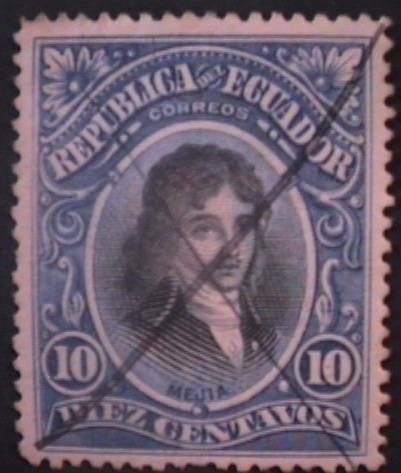 Three stamps (10 c, 20 c and 40 c) in the design of the 1894 stamps, but with inscription 'TELGRAFOS DEL ECUADOR' were issued in 1894. Besides these stamps, there are also some fiscal stamps with overprint 'TELEGRAFOS'. 2) 'FRANCA' (I have seen this cancel being used on forgeries of Buenos Aires, so I think it has been misplaced in the Founier Album).